From the Department of Family Medicine, Aurora UW Medical Group, University of Wisconsin School of Medicine and Public Health; Center for Urban Population Health, Milwaukee, WI. A variety of classic and emerging soil-related bacterial and fungal pathogens cause serious human disease that frequently presents in primary care settings. Typically, the growth of these microorganisms is favored by particular soil characteristics and may involve complex life cycles including amoebae or animal hosts. Specific evolved virulence factors or the ability to grow in diverse, sometimes harsh, microenvironments may promote pathogenesis. Infection may occur by direct inoculation or ingestion, ingestion of contaminated food, or inhalation. This narrative review describes the usual presentations and environmental sources of soil-related infections. In addition to tetanus, anthrax, and botulism, soil bacteria may cause gastrointestinal, wound, skin, and respiratory tract diseases. The systemic fungi are largely acquired via inhalation from contaminated soil and near-soil environments. These fungal infections are particularly life-threatening in those with compromised immune systems. Questions regarding soil exposure should be included in the history of any patient with syndromes consistent with tetanus, botulism or anthrax, traumatic wounds, recalcitrant skin lesions, gastroenteritis, and nonresponsive, overwhelming, or chronic pneumonia. Soil1,3 is a multilayered surface complex of mineral and organic (humus) constituents present in solid, liquid, and gaseous states. The mineral portion of soil results from the actions of weathering and erosion on rock. Broad soil type—sand, silt, or clay—is defined, largest to smallest, by particle size. These particles pack loosely, and pore spaces of varying sizes are formed. Particle surfaces, pore spaces, and plant roots are particular habitats for microorganisms, often in biofilms. Soil also contains plants, animals, carcasses, and man-made materials. In addition to the “classic” infections, tetanus and botulism, soil-related bacterial infections include wound infections, gastroenteritis, and specific respiratory syndromes. Anthrax, primarily a disease of herbivores, is caused by the Gram-positive, spore-forming rod Bacillus anthracis.20 Readers are referred to current literature regarding detailed descriptions of natural and bioterrorism-related anthrax presentations. In brief, cutaneous anthrax involves a pruritic papule on exposed skin, which ulcerates with surrounding vesicles, followed by black eschar. Inhalation anthrax begins with a nonspecific respiratory illness that may be confused with a variety of common respiratory illnesses,21 followed by a (usually fatal) sudden second phase of severe respiratory distress. Ingestion of food containing B. anthracis results in an abdominal form of gastrointestinal anthrax, an oropharygeal form, or both. Meningitis may complicate any form of anthrax, but this rarely occurs. Excepting dermatophytes, many environmentally acquired fungal infections were apparently uncommon until the emergence of immunosuppresive agents and drugs in the second half of the 20th century. Overall, relatively few endemic fungi cause human disease, and they seem to be pathogenic for mammals without a requirement for such a host during their life cycle. Mammalian body temperatures and layered immune systems seem to inhibit a majority of potentially pathogenic soil fungal species (and may have contributed to the proliferation of mammals and the extinction of dinosaurs). The ability to survive in warm-blooded, slightly alkaline animal environments may be the result of harsh selective factors in soil environments.48,49 Similar to infection with the bacterium, Burkholderia pseudomallei (discussed above), the chance of infection by soil fungi, and its outcome, are determined by geographic, soil, and environmental factors that determine the presence of the particular fungus, local strain virulence, active (eg, digging) or passive (eg, inhalation of windborne dust) soil exposure, and susceptibility of the host. Most commonly, soil-related endemic fungi cause primary pulmonary disease, with the potential for dissemination, or primary skin disease in normal or immunocompromised hosts. Clues to fungal disease include exposure to endemic areas (with or without a specific history of soil contact), immunocompromise, nosocomial exposure,50 and pneumonia, which is unresponsive to appropriate empiric antibacterial therapy. Blastomycosis is caused by Blastomyces dermatitdis, a dimorphic (mycelia/yeast) fungus (Figure 3) found in eastern North America and parts of India and Africa. Annual incidence of the disease ranges from <1 to 100 per 100,000 in endemic areas. Except for rare inoculation cutaneous disease, the organisms enter the body via inhalation of conidia from the environment (wind or excavation dust, digging, direct contact) into the lungs. Blastomyces dermatitidis: Example of endemic dimorphic fungal pathogen causing primarily pulmonary infection. A: Infectious mycelial (mold) forms of B. dermatitidis grown on Sabouraud dextrose agar at 20°C (magnification ×400). B: Yeast forms of B. dermatitidis grown on brain-heart infusion agar at 37° (magnification ×400). C: Chest radiograph illustrating 2 of several nonspecific radiographic patterns of pulmonary blastomycosis. A dense opacity in the right mid-lung fields and patchy infiltrates in the left lung are seen in this adult woman. A variety of bacterial and fungal microorganisms are capable of departing a soil environment to cause serious focal or systemic infection. Specific evolved virulence factors or the ability to grow in diverse, sometimes harsh, microenvironments may promote human infection. Questions regarding travel and soil exposure, by direct contact or ingestion, inoculation, or dust or aerosol inhalation, should be included in the history of any patient with syndromes consistent with tetanus, botulism or anthrax, traumatic wounds, recalcitrant skin lesions, gastroenteritis, and nonresponsive, overwhelming, or chronic pneumonia. Prompt recognition of tetanus and botulism, supportive intensive care, tetanus immune globulin or botulism antitoxin therapy, respectively, and adjunctive antibiotic therapy may significantly improve outcomes in affected patients. Prompt, directed antimicrobial therapy for anthrax, wound infection, and systemic fungal disease may be life-changing. Bacillus and Listeria gastroenteritis is usually self-limited in immunocompetent people, but investigation of their source(s) may be an important public health measure. The author thanks Kathy Strube for librarian assistance, Drs. John Brill and Jon Temte for review, Nicholas Baumgardner for figure preparation, and the late Sr. Beata Knoedler for original inspiration. Received for publication July 21, 2011. Revision received October 31, 2011. Accepted for publication November 3, 2011.
, eds. Environmental microbiology. 2nd ed. Amsterdam: Elsevier; 2009:70–80, 357–63, 445–7.
. The influence of soil on infectious disease. Experientia 1987;43:81–7. , ed. 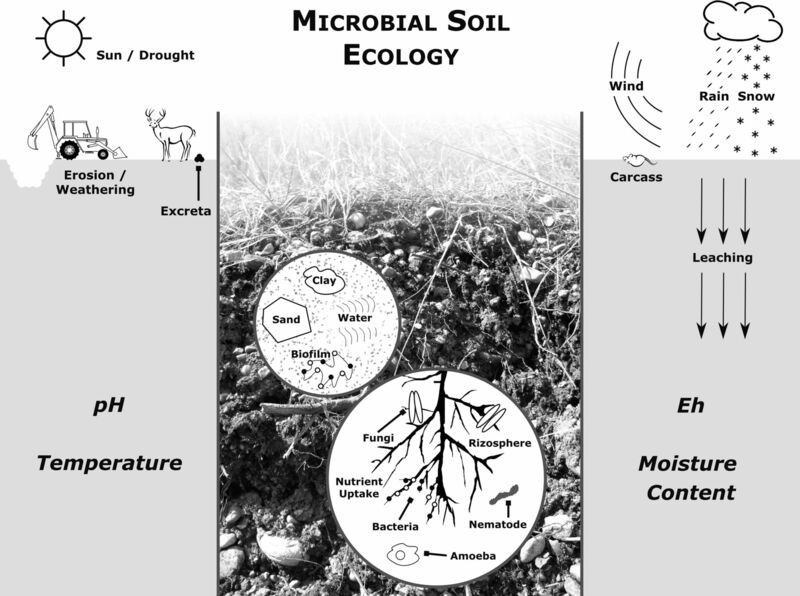 Soil microbiology, ecology and biochemistry. 3rd ed. Oxford: Elsevier; 2007.
. Brock biology of microorganisms. Microbial habitats, nutrient cycles, and interactions with plants and animals. 10th ed. Upper Saddle River, NJ: Prentice Hall; 2003:633–41.
. The rhizosphere as a reservoir for opportunistic human pathogenic bacteria. Environ Microbiol 2005;7:1673–85.
. Pathogenicity islands: a molecular toolbox for bacterial virulence. Cell Microbiol 2006;8:1707–19.
. Differentiate to thrive: lessons from the Legionella pneumophila life cycle. Mol Microbiol 2004;53:29–40.
. Fungal adaptation to the mammalian host: it's a new world, after all. Curr Opin Microbiol 2008;11:511–6.
. Aspergillus: a primer for the novice. Med Mycol 2009;47(Suppl 1):S5–12.
. Pathogenic anaerobic bacteria and the environment. Rev Sci Tech Off Int Epiz 1991;10:749–64.
. Current concepts in the management of Clostridium tetani infection. Expert Rev Anti Infect Ther 2008;6:327–36.
. Narrative review: tetanus–a health threat after natural disasters in developing countries. Ann Intern Med 2011;154:329–35. (ed). Control of communicable diseases manual. 19th ed. Washington, DC: American Public Health Association; 2008.
. Density and disctribution of Clostridium tetani in the soil. Jpn J Exp Med 1986;56:69–74.
. Clostridium botulinum (botulism). In: Mandell GL, Bennett JE, Dolin R , eds. Mandell, Douglas, and Bennett's principles and practice of infectious diseases. 7th ed. Philadelphia: Churchill Livingstone; 2010:3097–102.
. Early severe infantile botulism. J Pediatr 1993;122:909–11.
. Wound botulism acquired in the Amazonian rain forest of Equador. Am J Trop Med Hyg 2006;74:628–31.
. Human disease associated with Clostridium perfringens enterotoxin. Rev Environ Contam Toxicol 1997;150:75–94.
. Prevalence of enterotoxigenic Clostridium perfringes isolates in Pittsburgh (Pennsylvania) area soils and home kitchens. Appl Environ Microbiol 2007;73:7218–24.
. Bacillus anthracis (anthrax). In: Mandell GL, Bennett JE, Dolin R . eds. Mandell, Douglas, and Bennett's principles and practice of infectious diseases. 7th ed. Philadelphia: Churchill Livingstone; 2010:2715–25.
. The primary care differential diagnosis of inhalation anthrax. Ann Fam Med 2004;2:438–43.
. The ecology of Bacillus anthracis. Mol Aspects Med 2009;30:356–67.
. Incidence of Bacillus anthracis in soil. Soil Sci 2002;167:627–35.
. Foodborne illness acquired in the United States–major pathogens. Emerg Infect Dis 2011;17:7–15.
. Bacillus cereus, a volatile human pathogen. 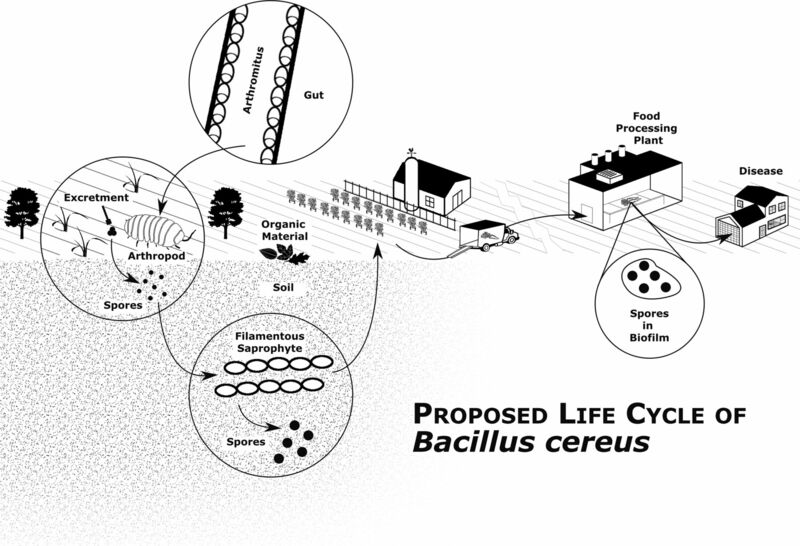 Clin Microbiol Rev 2010;23:382–98.
. From soil to gut: Bacillus cereus and its food poisoning toxins. FEMS Microbiol Rev 2008;32:579–606.
. The hidden lifestyles of Bacillus cereus and relatives. Environ Microbiol 2003;5:631–40.
. Listeria monocytogenes–from saprophyte to intracellular pathogen. Nature Rev Microbiol 2009;7:623–8.
. Enteric pathogens and soil: a short review. Int Microbiol 2003;6:5–9.
. Campylobacteriosis outbreak associated with ingestion of mud during a mountain bike race. Epidemiol Infect 2010;138:1695–703.
. Long-term survival of Escherichia coli 0157 on pasture following an outbreak associated with sheep at a scout camp. Lett Appl Microbiol 2002;34:100–4.
. Soil survival of Escherichia coli 0157:H7 acquired by a child from garden soil recently fertilized with cattle manure. J Appl Microbiol 2006;101:429–36.
. Survival of Escherichia coli 0157 in a soil protozoan: implications for disease. FEMS Microbiol Lett 1999;173:291–5.
. Burkholderia pseudomallei and Burkholderia mallei: melioidosis and glanders. In: Mandell GL, Bennett JE, Dolin R , eds. Mandell, Douglas, and Bennett's principles and practice of infectious diseases. 7th ed. Philadelphia: Churchill Livingstone; 2010: 2869–79.
. Ecology of Burkholderia pseudomallei and the interactions between environmental Burkholderia spp. and human-animal hosts. Acta Tropica 2007;74:159–68.
. The molecular and cellular basis of pathogenesis inmelioidosis: how does Burkholderia pseudomallei cause disease? FEMS Microbiol Rev 2009;33:1079–99.
. Commercial potting soils as an alternative infection source of Legionella pneumophila and other Legionella species in Switzerland. Clin Microbiol Infect 2009;15:571–5.
. Isolation of Legionella longbeachae serogroup 1 from potting mixes. Appl Environ Microbiol 1990;56:49–53.
. An outbreak of Pontiac fever due to Legionella longbeachae serogroup 2 found in potting mix in a horticultural nursery in New Zealand. Epidemiol Infect 2010;138:15–20.
. Legionnaires' disease and gardening. Clin Microbiol Infect 2007;13:88–91.
. Soil as a source of Legionella pneumophila serogroup 1 (Lp1). Aust N Z J Publ Heal 2005;29:518–20.
. Legionella longbeachae and legionellosis. Emerg Infect Dis 2011;17:579–83.
. Relationships between Mycobacterium isolates from patients with pulmonary mycobacterial infection and potting soils. Appl Environ Microbiol 2006;72:7602–6.
. Epidemiology of infection by nontuberculous mycobacteria. V. Numbers in eastern United States soils and correlation with soil characteristics. Am Rev Respir Dis 1984;130:630–3.
. Is soil an alternative source of leprosy infection? Acta Leprol 2001;12:79–84.
. Detection of viable Mycobacterium leprae in soil samples: insights into possible sources of transmission of leprosy. Infect Genet Evol 2008;8:627–31.
. The gardner's cellulitis. Am J Med 2009;122:27–8.
. Vertebrate endothermy restricts most fungi as potential pathogens. J Infect Dis 2009;200:1623–6.
. Fungal virulence, vertebrate endothermy, and dinosaur extinction: is there a connection? Fungal Genet Biol 2005;42:98–106. , eds. Diagnosis and treatment of human mycoses. Totowa, NJ: Humana Press; 2008.
. Approach to the diagnosis of the endemic mycoses. Clin Chest Med 2009;30:379–89.
. Ecological niche modeling of Coccidioides spp. in western North American deserts. Ann N Y Acad Sci 2007;1111:35–46.
. Assessment of climate-coccidioidomycosis model: model sensitivity for assessing climatologic effects on the risk of acquiring coccidioidomycosis. Ann N Y Acad Sci 2007;1111:83–95.
. Symptomatic coccidioidomycosis following a severe natural dust storm. Chest 1979;76:566–70.
. An epidemic of coccidioidomycosis among archeology students in Northern California. N Engl J Med 1972;286:507–12.
. A coccidioidomycosis outbreak following the Northridge, Calif, earthquake. JAMA 1997;277:904–8.
. An unusual outbreak of windborne coccidioidomycosis. N Engl J Med 1979;301:358–61.
. Comparative genomic analyses of the human fungal pathogens Coccidioides and their relatives. Genome Res 2009;19:1722–31.
. Blastomyces dermatitidis. In: Mandell GL, Bennett JE, Dolin R , eds. Mandell, Douglas, and Bennett's principles and practice of infectious diseases. 6th ed. Philadelphia: Elsevier; 2005:3026–40.
. The differential diagnosis of pulmonary blastomycosis in Wisconsin: a Wisconsin Network for Health Research (WiNHR) study. Wis Med J 2011;110:68–73.
. Clues to the presence of pathogenic fungi in certain environments. Med Mycol 2000;38(Suppl 1):67–77.
. Studies on the molecular ecology of Blastomyces dermatitidis. Mycopathologia 2000;152:51–8.
. Microecology of Blastomyces dermatitidis: the ammonia hypothesis. Med Mycol 2009;47:745–52.
. Effects of season and weather on blastomycosis in dogs: Northern Wisconsin, USA. Med Mycol 2011;49:49–55.
. Histoplasma capsulatum. In: Mandell GL, Bennett JE, Dolin R , eds. Mandell, Douglas, and Bennett's principles and practice of infectious diseases. 6th ed. Philadelphia: Elsevier; 2005:3012–26.
. Endemic fungal infections in the Asia-Pacific region. Med Mycol 2011;49:337–44.
. The possible role of uric acid in the ecology of Histoplasma capsulatum. Mycopathol Mycol Appl 1968;35:377–88.
. Recurrent urban histoplasmosis. Indianapolis, Indiana, 1980–1981. Am J Epidemiol 1983;118:301–12.
. Bats in the belfry: an outbreak of histoplasmosis. Am J Public Health 1982;72:1369–72.
. Identification of the infectious source of an unusual outbreak of histoplasmosis, in a hotel in Acapulco, state of Guerrero, Mexico. FEMS Immunol Med Microbiol 2005;45:435–41.
. Hitchcock's birds, or the increased rate of exposure to Histoplasma from blackbird roost sites. Chest 1981;80:434–8.
. Paracoccidioidomycosis. In: Hospenthal DR, Rinaldi MG , eds. Diagnosis and treatment of human mycoses. Totowa, NJ: Humana Press; 2008:331–42.
. Paracoccidioides brasiliensis: phylogenetic and ecological aspects. Mycopathologia 2008;165:197–207.
. Climate and acute/subacute paracoccidioidomycosis in a hyper-endemic area in Brazil. Int J Epidemiol 2009;38:1642–9.
. Penicillium marneffei infection and recent advances in the epidemiology and molecular biology aspects. Clin Microbiol Rev 2006;19:95–110.
. Case-control study of risk factors for Penicillium marneffei infection in human immunodeficiency virus-infected patients in northern Thailand. Clin Infect Dis 1997;24:1080–6.
. Sporotrichosis. In: Hospenthal DR, Rinaldi MG , eds. Diagnosis and treatment of human mycoses. Totowa, NJ: Humana Press; 2008:343–54.
. Outbreaks of sporotrichosis. Curr Opin Infect Dis 2008;21:119–21.
. Taxonomy and phylogeny of new wood- and soil-inhabiting Sporothrix species in the Ophiostoma stenoceras-Sporothrix schenckii complex. Mycologia 2008;100:647–61.
. Wound zygomycosis (mucormycosis) in otherwise healthy adults. Am J Med 1988;84:546–8.
. Mycoses of implantation in Latin America: an overview of epidemiology, clinical manifestations, diagnosis and treatment. Med Mycol 2011;49:225–36.
. Madura foot–mind the soil. J Plas Reconstruc Aesthetic Surg 2010;63:e576–8.
. Mycetoma caused by Madura mycetomatis: a neglected infectious burden. Lancet Infect Dis 2004;4:566–74.
. Aspergillosis. In: Hospenthal DR, Rinaldi MG , eds. Diagnosis and treatment of human mycoses. Totowa, NJ: Humana Press; 2008:181–99.
. Counterpoint: invasive aspergillosis and the environment–rethinking our approach to prevention. Clin Infect Dis 2001;33:1549–52. A Molecular Window into the Biology and Epidemiology of Pneumocystis spp.